Today started off as one of those days that I dream of all year - a throw on a dress no need for a piece of knitwear kind of day. As we headed out for our day at a National Trust property the sun was shining and all was well. I should have realised that ridiculously high wedges and the uneven paths outside old properties really weren't a match made in heaven and I nearly came a cropper. However my dignity and my ankle were saved by the child's scooter that I was carrying. When I returned home, the wedges were hastily replaced by converse for the dash up to ballet and the school run. I much preferred the wedges with the dress and a different colour converse would have been better but there was no time for such a debate. I've been a bit negligent in posting of late - for some reason I don't seem to have had the time. I could pretend that it was because I was doing something amazingly interesting but then that would be a lie. I can't even pretend that I have been practising the lyrics to Take That - although I must confess that I would have been, had it not transpired that our Take That tickets were sold to us by a website that didn't actually own them in the first place. Not that I am annoyed or anything about not seeing Gaz and the boys strut their stuff. Anyway, this photo was taken a few days ago now. It was our son's sports day and I mean "day". It goes on from 9.30 am until 4.00pm. If the organisers of the Olympics need any tips - they know where to go for help. We even get coffee served in proper paper cups - with a lid no less. Anyway, the weather was cold, wet and windy -but nonetheless we (by that I mean the parents) soldiered on regardless, embarrassing our children with our cheers. Well I did anyway, with great satisfaction I hasten to add. It's good that they learn what it feels like to be embarrassed given that they do it to us all the time. 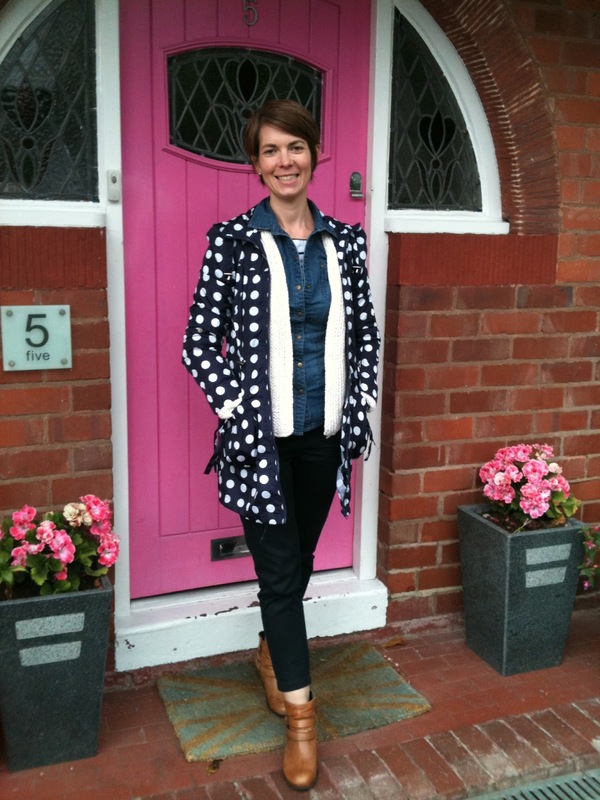 So, whilst I may have looked like the Michelin man with my layers of vest, stripey top, denim shirt, cream cardi and spotty mac I was, at least warm and dry. As our youngest was having her bath tonight, she reminded me of the incident with her friend Henry - who took it upon himself to see if she could fly like a bat. Having catapulted her from a toy at playgroup, and instructing her to flap her arms, they both realised that she could not, in fact, fly like a bat. She informed me that had he requested her to fly like a fairy she would have succeeded - it was the bat bit that was at fault, not the fact that she couldn't fly per se. So that was today's thought for the day. Now, turning to the outfit - having been caught out yesterday with the heat, I duly did what needed to be done on the beauty front and wore a skirt. Only for it to rain. 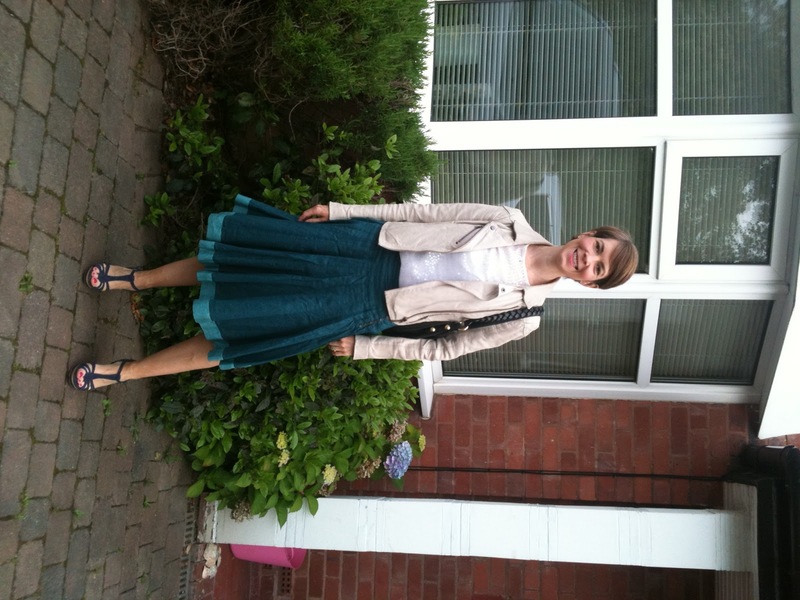 Nevermind - it was lined so I was warm enough and the leather jacket just put the skirt just on the right side of twee. Now to Tracy Anderson. She claims to gently wake up our accessory muscles. Mine feel more like they have been ripped from their slumber and forced to march a thousand miles. So at the moment I am finding it hard to move. I may be writing from my bed tomorrow. Mum on the Run - Tracy Anderson here I come! Today I found my perfect outfit and it is priceless - literally priceless as it has virtually no value whatsoever. In fact it really should belong in a charity shop but there's no way that I am parting with it now...but more about that one later. I was slightly caught out by the heat today, hence the maxi dress which covered up a multitude of sins - the details of which I won't go in to. It's a silky jersey maxi dress from French Connection - virtually see through which is why it has long vest layered underneath. 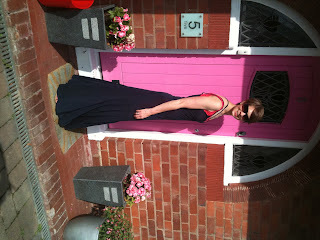 I put it with flat sandals which were great for the school run. Now, back to the pefect outfit. As I was walking along the landing, I bumped into our eldest daughter who was coming out of the bathroom. She looked at me and said "Oh, you look really young." Oh the joy in that comment - and what I was wearing? The oldest pale blue terry towelling shorts you could imagine, courtesy of the white company and the coral vest from New Look that I am wearing in the above photo. Why was I wearing this outfit? Because I was about to embark on my new Tracy Anderson DVD - but there goes another story. The morning started with our three year old being taught how to use a Nerf gun by her brother (including re-loading it) and taking great delight in shooting me with about 20 foam bullets. Her skills know no bounds. She is also in the process of conning the tooth fairy by putting her older sister's teeth under her pillow. I think that she must have been watching the Apprentice on the quiet. For those of you who saw my twitter message this morning, you will know that today was the day of the school fete and that my significant contribution was to serve on the Chinese food stall. As I felt a little under attack (what with that, being in charge of our own children plus their cousins - and because rain was forecast) I was planning on wearing combats - which I thought seemed appropriate. 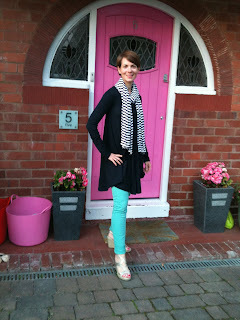 However my plans changed and I decided to go for the green jeans, stripey top and Cos swing cardi. Fortunately I also took a denim shirt with me, which I put on when the temperature dropped below 10 degrees. Amazingly all went well at the school fete - our youngest wasn't thrown from Suzie the donkey, the kids didn't trash the inside of the fire engine, I probably haven't guessed correctly the weight of the chocolate cake (but then I am not sure that I want it anyway given that half the school has handled - and probably sneezed over - it.) We are now settling down to the mean cocktails which my South American sister in law has made. Bliss! Mum on the Run - Liz Hurley eat your heart out! When I wear white jeans I always feel that I am doing a bit of a "Liz" (Hurley) - she who wears white jeans come rain or shine, winter or summer, whether they are the height of fashion or not. They are part of her uniform, together with huge sunglasses and her son who has the most incredible haircut I have ever seen. Anyway, for some reason it amuses me (the constant wearing of white jeans - and the haircut if I am honest - not that I like to criticise another mother) but there we go - lots of little things do. Anyway, this was the second outfit of the day as the first had been abandoned for something more comfortable, after the meeting I went to this morning. 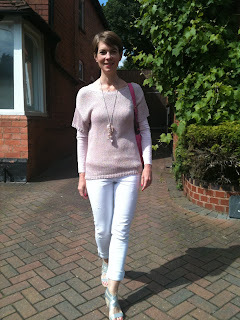 It's very straightforward really, white jeans (GAP) and pale pink long sleeved top plus pale pink short sleeve cotton jumper over the top (both H&M) with a long pendant. I was happy and comfortable enough. We are all now safely returned from our holiday. I was delighted to hear our eldest explaining to our youngest before we took off that, should we crash into the sea, she (the youngest) should make sure that she left her false teeth, cigarettes and high heels behind as per the safety card. Jolly good. Since we have been back there has been some illness (mine) a funeral (not mine) and slowly life is returning to normal. Well, as normal as it ever gets around here. Today I met two new lovely ladies. 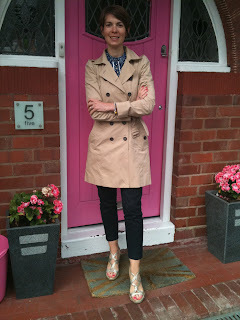 It wasn't exactly warm and it was forecast to rain so I went for the classics - navy cropped trousers (no chance of soggy hems) platforms (so I was raised from the rain) and a mac for good measure, teamed with a pretty blouse from Hobbs. Mum on the Run - another couple of days on holiday! This is yesterday's outfit, which I didn't get around to posting until today because last night we were all at my Dad's eating, you guessed it....crab! The children had been up there preparing them for us. Apparently all had gone well until our son had taken to wielding the knife and hammer in a rather unruly fashion. I am sure that if we were in England social services would have been informed by now but all sorts of odd things go on down here that wouldn't go on at home. Driving on the pavement is a given. Child seats aren't required (not that we went without). There's no health and safety or employment legislation and the drink driving laws are a bit lax - but wee up the harbour wall and you had better watch out. The Magistrate will have your guts for garters. As to the outfit - this is a bit of a nod towards vintage - lace top, cashmere cardi, Cath Kidston pumps and rolled up jeans. It was all good for walking along the beach, rock pooling and having fun with the children. Today's outfit required some planning because there was a very distinct danger that I was going to be up past my knees in rock pools - and shorts and I really don't get on. So I decided that I would wear a dress over linen trousers on the basis that I could remove the trousers and hitch my dress up. 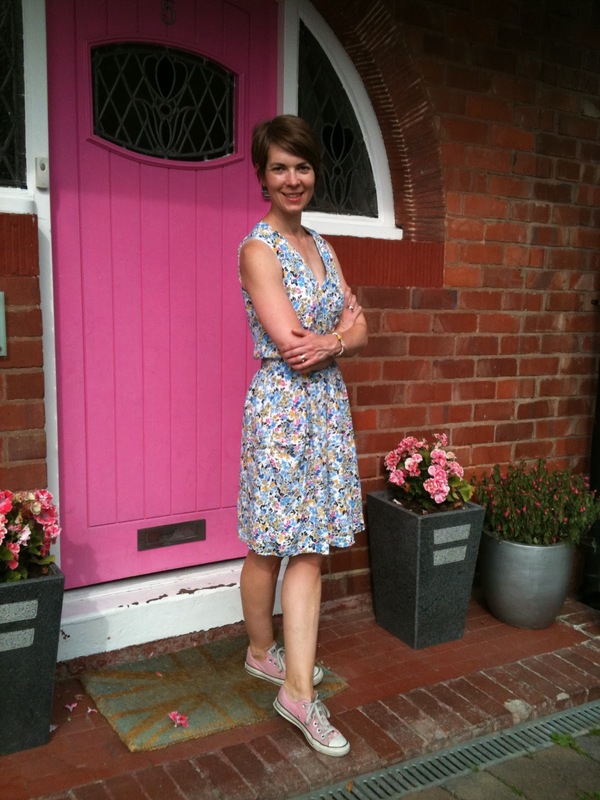 Half an hour of my dress hitched up is far preferable to me (and the rest of the world) than me wearing shorts for a day. It all got a bit chilly when I went paddling and the trousers got wet but I just rolled them up and lived with the damp. I am pleased to report that the capsule (in the loosest sense of the word) wardrobe worked really well. At no point did I feel that I had run out of clothes or that I didn't have the right thing for the right occasion. This may largely have been due to the fact that we spent a lot of time on the beach rock pooling, in cafes or in the sea (in which case I was in a wetsuit) but it worked well and the thing that makes me happiest of all - I have had a chance to get lots of washing done and we are going home with a suitcase full of clean clothing. I think that I need to get out more! It has been such a funny day, I don't even know where to start. We have just come back from having a BBQ on the beach. The BBQs didn't quite get up to the heat that they should have done - great if you like bacon, stuffed peppers and halloumi (me) not so great for those of the steak persuasion. So, we have returned to our friend's apartment for steak, dodging our apartment on the way, just in case the children should spot us. We were listening to Island FM this morning. If ever you are in need of a lift, that is the radio station to listen to. They have this slot where they talk about missing animals. Apparently a three and a half foot lizard has escaped from somewhere in Guernsey and a cat is missing too. So funny. There is a local arsonist on the island at the moment who keeps setting fire to cars. The police have advised people that they really should keep their car doors looked at all times. Lock their cars at all times - not sure that the police in England really need to spell that one out to people. Still on the leaving unlocked car note, our eldest was apparently sitting in the boot of someone else's car today for about five minutes before realising that ours was the car next door. How she failed to notice the double buggy and 2 car seats in the car is beyond me but there you go. The youngest's latest habit (in addition to farting, swearing and making her knickers look like a g-string) is to blow down her nose as hard as she can then find a tissue, stick it to her face with the contents of her nose and walk around. She thinks it's funny. So, as to the outfit. I am sporting my new sunglasses which I bought from the local stores. Oh what a shop - there is all manner of rubbish in there that you wouldn't even know you needed. My husband and I both bought sunglasses, he bought a cap and we got pressies for the children, all for about £18. 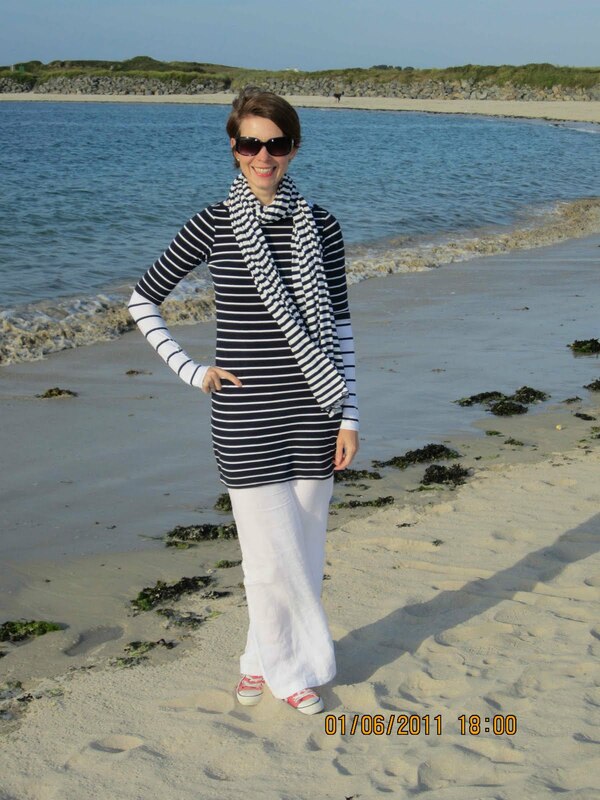 I have gone for the triple stripes look today - 2 tops and a scarf. Well, I said that there were lots of stripes in my wardrobe this week. Hopefully it will be warmer tomorrow so maybe something other than stripes will make an appearance - or maybe it will be the wetsuit after the 7am swim which is planned! 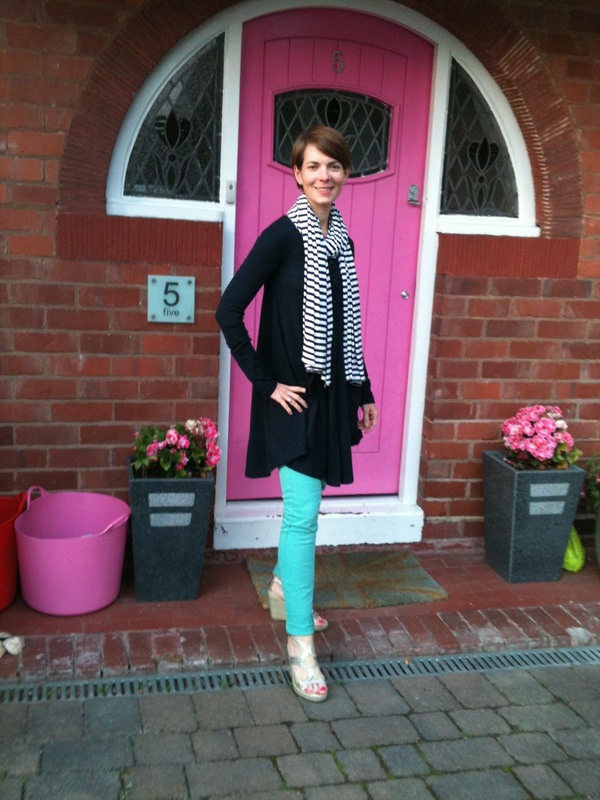 Outfit - Trousers Kew, Tops H&M and French Connection, Scarf Zara, Converse Jones.